DDA demonstrates the unique possibilities of digitally interacting with the real world through this augmented reality holiday decoration application. Apple’s ARKit is a revolutionary breakthrough for augmented reality. The ARKit uses the iPhone’s camera(s) and various motion detectors to gather information about the environment around the device and its place within it in real time. This establishes the baseline of information needed in any augmented reality application, so that AR apps can interact with their environments with added information and graphics in real time. With the advent of Apple’s ARKit, DDA saw an opportunity to expand upon its previous experience in augmented reality and demonstrate the potential the technology now has to a much broader audience of users. DDA would develop a new augmented reality application for iPhone that would show the world the expanded capabilities of the device with Apple’s new augmented reality platform. Now any user of iPhone model SE, 6, or above, or fifth generation iPad or iPad Pro, could benefit from the unique interaction of computer simulated graphics and information with a real-world view. DDA would begin with an application that would allow the user to decorate the world around them, just in time for the Christmas holiday. DDA programmed the new Trim-A-Tree AR iPhone application with one thing in mind: fun! Users simply open the app, look around their environment to allow for proper scene mapping, then place Christmas decorations wherever they like. 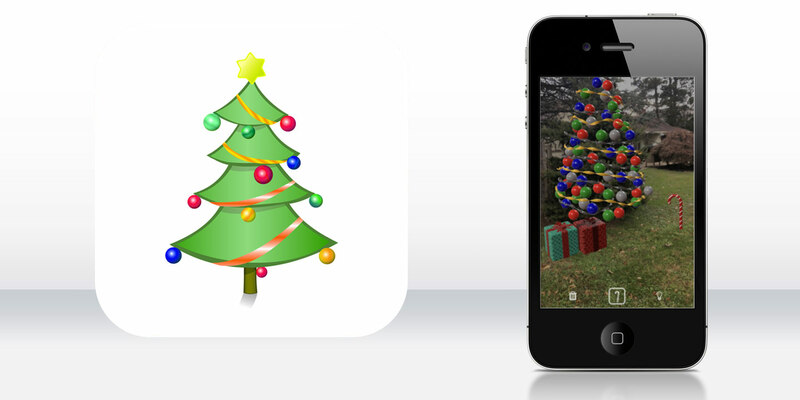 Users can place fully decorated Christmas trees in view, candy canes, or gift boxes of various designs. Decorations can be placed on any floor or tabletop surface. Decorations can be reduced or expanded in size to match the setting appropriately. Users can also place decorations onto existing trees. Still shots can be captured within the app to be saved and shared. The final augmented reality iPhone application is the perfect way to get people into good holiday cheer, while demonstrating the serious potential augmented reality possesses to transform how we view and interact with the world around us.